If you already have a Microsoft Azure account and use Azure containers for storing and managing your files, you can make use of your existing containers and folder paths when unloading data from Snowflake tables. This topic describes how to use the COPY command to unload data from a table into an Azure container. You can then download the unloaded data files to your local file system. 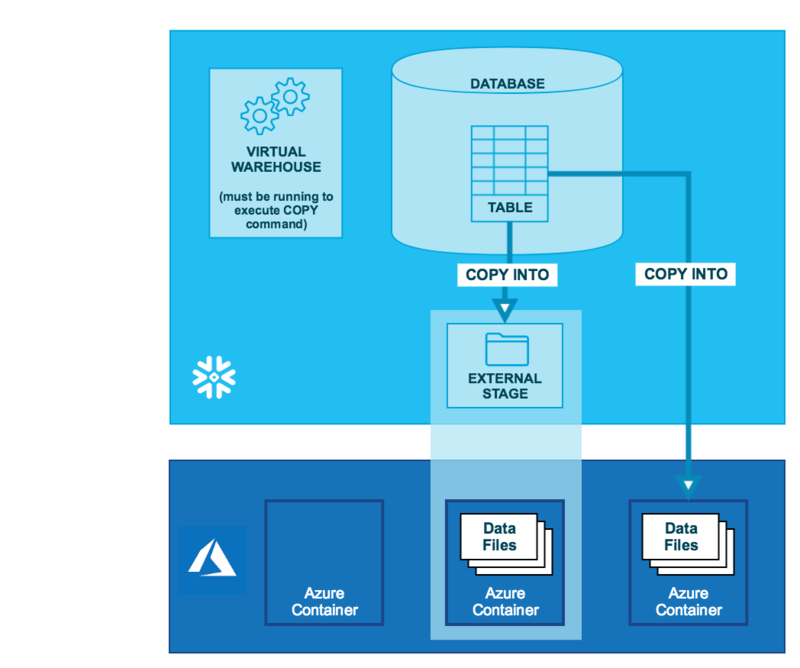 Use the COPY INTO <location> command to copy the data from the Snowflake database table into one or more files in an Azure container bucket. In the command, you specify a named external stage object that references the Azure container (recommended) or you can choose to unload directly to the container by specifying the URI and security credentials (if required) for the container. Regardless of the method you use, this step requires a running, current virtual warehouse for the session. The warehouse provides the compute resources to write rows from the table. Use the interfaces/tools provided by Microsoft to download the files from the Azure container. For Snowflake to write to an Azure container, you must generate a shared access signature (SAS) token for your storage access account. For configuration instructions, see Configuring an Azure Container for Loading Data. External stages are named database objects that provide the greatest degree of flexibility for data unloading. Because they are database objects, privileges for named stages can be granted to any role. Note that the AZURE_SAS_TOKEN and MASTER_KEY values used in this example are for illustration purposes only. Use the COPY INTO <location> command to unload data from a table into an Azure container using the external stage. Use the tools provided by Azure to retrieve the objects (i.e. files generated by the command) from the container. Use the COPY INTO <location> command to unload data from a table directly into a specified Azure container. This option works well for ad hoc unloading, when you aren’t planning regular data unloading with the same table and container parameters. You must specify the URI for the Azure container and the security credentials for accessing the container in the COPY command. Use the Azure console (or equivalent client application) to retrieve the objects (i.e. files generated by the command) from the container.